Rochester Lancers (Indoor) In 1995, SoccerSam purchased the Rochester Lancers name and logo as part of his soccer memorabilia collection. In 2010, SoccerSam started negotiating with the Chris Economides of the USL to be part of the new indoor I-League. The USL struggled to attract teams to the newly formed I-League. At the 2010/2011 MISL Championship game in Baltimore, SoccerSam convinced MISL commissioner David Grimaldi to meet with the USL and bring current teams. 2011/2012 the new MISL under the USL banner was launched with 4 existing MISL teams and 3 new I-League teams. SoccerSam decided to use his beloved Rochester Lancers name and logo for this new indoor MISL team. SoccerSam brought in lifelong friends to help with this venture. On the ownership side, Sam brought in local businessman & former minority owner of the Rhinos, Christopher J. Wilmot; cousin John Coraggioso, a longtime franchisee in the Salvatore's Old Fashioned Pizzeria chain; local businessmen & owners of over 30 Dunkin' Donuts locations Luis Ribero & Dom Vieira; and CPA Steve Stokes, all lifelong soccer fans. For social media & internet support, he brought in Mike Moran of Spinning Webs, who helped create the Rochester Rhinos web site. Rich Randall, who had worked side by side with Sam in 2008 and 2009 as they helped re-launch the Rhinos with Rob Clark was named VP of Soccer Operations. Mike Moran, Patty Powers, Donna Wassdorp, Kayla Klark Kent, Lyndsay Dimeo, Ashley Maria King operated the day to day with Sam & Rich with several amazing college interns. Several friends and former Rhinos staff members volunteered to help Sam with the indoor Lancers. Jill Rizzo, John Catalano, Joe Giuliano, Rocky Perrotta, Phil Mercato, James Weise and Eric Trendel all helped with the game day. Patty Powers handled the marketing as she had been for the past 18 years for all of Sam's projects. On the team side former Rhinos players and staff helped launch this new indoor team. Dave DiPasquale, John Berardicurdi, Billy Andracki, Craig Demmin, Francisco Escos, Billy Ginther, Rey "Boom-Boom" Martinez, John Ball, Mauricio Salles, Patrick Hannigan and the living legend Doug Miller. The indoor Rochester Lancers began play in the Fall of 2011 at their home field the Blue Cross Arena at the Rochester Community War Memorial and played three seasons in the USL owned MISL and one season in the MASL. The indoor Rochester Lancers were forced to take the 2015-16 season off because of NYSIF and NY Workmen's Comp issues. In May 2016, Ed Hale founded the IPL - Indoor Pro League - and named SoccerSam Fantauzzo its first Commissioner. Months later SoccerSam helped negotiate the return of teams to the MASL for the 2016/2017 season. The Blast won the championship! In April, 2017 SoccerSam was approached by Marc Mandell, Nick Mojsovski and Doug Miller to join the NPSL Rochester RiverDogz. The name and logo was changed to Rochester Lancers. Also in April 2017, the New WNY Flash joined the UWS league and needed a travel partner. SoccerSam & Ashley Maria King introduced the Lady Lancers in less than 30 days! Ashley Maria King serves as the VP of Operations of both teams. For the 2017 season, the NPSL Lancers record was 6/4/2. The squad missed the playoffs by a single point. The Lady Lancers went winless in year one. On 2/1/2018, Kayla Klark Kent rejoined the Lancers as Director of Soccer Operations. Chris Wilmot, a Rochester native, is a former Monroe County Legislator, Co-Producer of two Hollywood films, Executive Producer of an independent South African film, and a Journalist for, and Publisher of the Rochester-based online political watchdog website, the SmugtownBeacon.com. Chris' life-long love of soccer began as a child playing soccer in the Pittsford School District. He has been a season ticket holder of the Rochester Rhinos since the team was formed in 1996. Chris watched many Lancer games in Holleder Stadium in the mid to late 1970's, including the locally famous game when Pelé and the Cosmos came to town during the 1977 playoffs. Chris has attended two World Cups, seeing two matches in Germany in 2006 and four matches in Michigan in 1994. He is a former co-owner of the Rochester Rhinos (2006-07). Chris currently resides in Pittsford, NY with his life partner Kathy Goll. He is a graduate of St. John Fisher College. Chris proudly served for 10 years as a Monroe County Legislator, directly representing 25,000 residents in the 21st Legislative District comprising southeastern Rochester(1996-2005). During his tenure, he introduced legislation to help improve educational opportunities for low-income children in the Rochester City School District, and offered assistance to help provide affordable day-care for low income working parents. During his 10 years in office, he voted on the appropriation of over $9.3 billion, on behalf of 730,000 Monroe County residents. Chris, a movie aficionado, began financing Hollywood productions in 2003 with his first venture Lost, starring actor Dean Cain, which had a limited theatrical release in the Los Angeles area. Lost also aired on the Encore Action Network, and is available on DVD. In 2006, Chris helped finance, and was a co-producer for the movie Jam, featuring actors Marianne Jean-Baptist, Alex Rocco (Moe Green in The Godfather), and JefferyDean Morgan. Jam recently played on Showtime and The Movie Channel (TMC) networks, and is also available on DVD. His most recent film project, Lucky, a touchingstory of a young South African orphan, is currently competing in international film festivals, and is projected to release worldwide in the spring of 2012. Chris served on the board of the James P. Wilmot Foundation, for cancer research,from 1986-1996. A few years later, he was appointed to the board of Farm WorkerLegal Services of New York State, helping fight for the rights of migrant farm workers.In 2007, Chris was motivated to establish his news and political watchdog publication,the SmugtownBeacon.com, to provide a more honest, non-partisan, candid news alternative to fill the void left by Rochester's mainstream media. His investigativejournalism offers unique governmental and political insights, and insider analysis. To send a message to Chris, please visit our CONTACT page. 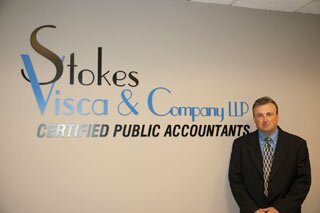 Stephen Stokes is the Founder and President of Stokes, Visca & Co., LLP – Certified Public Accountants. He founded the firm in 1996 and shortly thereafter brought his partner Paul Visca into the firm. His firm currently provides accounting and taxation services to over 400 local businesses and 2,500 individuals throughout the country. Steve is also the Founder and President of CPA Payroll Inc., which provides payroll services to small businesses in New York State and Florida, and a Founder and Vice president of Core Financial Services, Inc., which provides financial planning services to individuals and small businesses. Steve is a supporter of the Association for the Blind, and his firms support the Walk for Hope and several cancer societies. Prior to starting his own businesses Steve worked for the national accounting firm Coopers & Lybrand (PricewaterhouseCoopers) for 10 years, rising to the position of Senior Manager. He then served as the CFO and Controller for Billitier Electric in Rochester, NY. Steve received a Master of Business Administration – Finance degree from RIT and a Bachelor’s Degree in accounting from St. John Fisher College. Steve’s love of soccer began when he was eight years old. He began playing in the Irondequoit Travel Soccer League, and continued to play on the Bishop Kearney High School team. He played in college until he decided to take a job at Chase Bank instead, to focus on his chosen course of study. Steve coached youth soccer for five years in Fairport and recently served on the board of directors of the Fairport Soccer Club. His 14-year-old son Ryan currently plays in the Empire United Soccer Club. Steve has been a Rhinos season ticket holder since the team was founded in 1996. 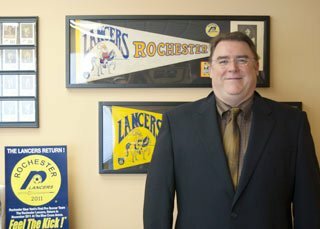 As a boy in the late 1970s, Steve and his friend would ride their bikes from Irondequoit to Holleder Stadium, located in western Rochester, so they could be ball boys for practice sessions for the Rochester Lancers and watched almost every Lancer game in Holleder Stadium. Steve is a fan of soccer worldwide and specifically follows the New York Red Bull, and the English teams Stoke City and Manchester United. Steve, his wife Karen, daughter Kristin, and son Ryan live in Fairport, NY. To send a message to Steve, please visit our CONTACT page. 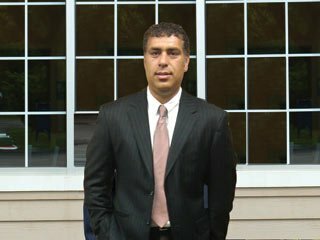 Dom Vieira is a co-owner of 22 Dunkin’ Donuts locations in the Greater Rochester area, primarily on the eastern side of Monroe County and extending into Avon and Geneseo. He and his wife Paula, relocated to the Rochester area in 2001 to help build a Dunkin’ Donuts franchise, starting with one store and consistently adding four to five new stores per year. Paula is the franchise’s Director of Operations. Dom’s love of soccer began at the age of 10. Growing up in Halifax, Nova Scotia, he played soccer as a young boy both, indoor and outdoor. Progressing quickly, at the age of 15 he was playing competitively against adult men’s teams and he was the youngest player on the Outdoor Nova Scotia Provincial Youth 16 Team, competing against other provincial teams. Dom played first division, semi-pro in Nova Scotia from the age of 18 through 21, which was the highest level league during that time in Canada. He played semi-pro for the Halifax Dartmouth Croatia and Halifax King of Donair He played mostly as a center mid-fielder and sometimes as a sweeper. Unfortunately, Dom’s soccer career was cut short at the age of 21 by a severe, and at that time, inoperable knee injury in 1988. He did, however, continue to play recreationally. Dom has been an avid soccer fan his entire life, following not only his hometown teams, but also soccer on the world stage, with a particular affinity for the Portuguese teams, the country of his family’s origin. Dom follows European and World Cup leagues closely. He has traveled to see international games, such as a Sporting Lisbon Braga match in Portugal in 2009. Dom has been a season ticket holder of the Rochester Rhinos since 2003 and loves going to the women’s Flash games. Dom, his wife Paula and son Jonathan live in Webster, NY. Jonathan also loves soccer and is currently playing in the Webster Youth Soccer League. Dom enjoys golfing and is a member of the Webster Golf Club. Dom’s Dunkin’ Donuts stores regularly support local and national charitable organizations, including the National Breast Cancer Research Foundation, local fundraising events, school functions and charitable golfing events. To send a message to Dom, please visit our CONTACT page. John is a hard-nosed working entrepreneur, who worked his way up to the President and Chief Financial Officer of all 22 Salvatore’s Old Fashioned Pizzeria Restaurants. John currently owns and operates several locations, co-owns Donuts Delite located at Empire Blvd. and Culver Rd. 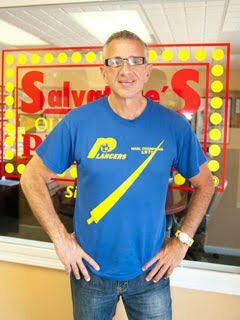 In 1989, at the age of 24, John purchased the original Salvatore’s on East Main Street. John introduced computers to the company; the first pizza chain in Monroe County to do so. He perfected the pizza dough and bread recipes and installed Air Deck Ovens in all locations. Today, the East Main Salvatore’s location is the busiest pizzeria in Monroe County. In 2009, John partnered with Salvatore Fantauzzo to bring back the locally famous Donuts Delite restaurant, which had been a Rochester tradition from 1958 to 2005. John grew up going to Donuts Delite with his family and used to pick up donuts for his employees on East Main Street. The historic building had been completely restored and reopened in January 2010 and carries the world famous Rochester donuts, as well as Salvatore’s famous menu. John is the President of the East Main Business Association. He is involved in the Kiwanis Club and Camp Good Days and Special Times. John is a former youth league and high school soccer player and a fan of U.S. and European professional soccer. John resides in Webster with his wife Dorothy and their two children Giovanni, age 14 and Gabrielle, age 11. Giovanni is fulfilling his father’s dream of playing soccer and has been playing since age 6. He is currently an elite player on Doug Miller’s U-14 team. Giovanni is also involved with the Webster Soccer Association and the Olympic Development Program. Gabrielle is involved with karate and gymnastics. Both John and Dorothy are active in their children’s sports and enjoy watching soccer as a family. To send a message to John, please visit our CONTACT page. Luis Ribeiro is a co-owner of 22 Dunkin’ Donuts stores in the Greater Rochester Area. Luis also manages 45,000 square feet of commercial real estate and is a licensed pilot. Luis began his career with Dunkin’ Donuts in 1992 in Boston working part-time overnights while attending flight school to earn his pilot’s license. At the age of 22, he received his pilot’s license at the same time that pilots were coming back to the US from the Gulf War, flooding the market with pilots all vying for jobs with commercial airlines. During that time, Luis had begun managing stores and aspired to become an owner. So he pursued a Dunkin’ Donuts opportunity in Rochester in 2001, inviting his brother-in-law Dom Vieira (also a Lancer’s Co-Owner) and sister Paula to join him in developing a franchise in Rochester, New York. He and his business partners have quickly grown their Rochester Dunkin’ Donutsfranchise from their first store in 2001, adding four to five new stores per year. Together they are the hands-on owners/managers of 22 locations in the eastern portion of Monroe County, extending to Avon and Geneseo. Luis was awarded the Dunkin’ Donuts Innovator of the Year Award in 2006 for his unique store design, at the Penfield location, which other franchises are now emulating. Luis’ love of soccer began at the age of six, when he began playing organized soccer in Halifax, Nova Scotia. He played for his junior high school and high school teams and progressed quickly, playing Division I men’s soccer at the age of 16! Due to repeated ankle injuries, Luis retired from competitive play at the early age of 19. He then coached youth boys and high school girls teams. He also enjoyed playing indoor and outdoor recreational soccer in men’s leagues while living in Boston in the 1990’s. Luis is a life-long soccer fan following the US and Portuguese national teams, and European League teams Real Madrid, Barcelona and Manchester United. He has been a Rhinos season ticket holder since 2003 and is a huge fan of the Western New York Flash Women’s team, which he believes has brought “truly world-class soccer” with world-class players to Rochester. 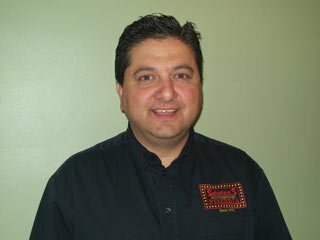 Luis and Dunkin’ Donuts proudly support the Arc of Monroe, the Wilmot Cancer Center, and several smaller organizations, and Luis plans to begin serving on charity boards, now that his franchise development phase is winding down, allowing him more free time to explore community service opportunities. Luis is currently single and resides in Webster. He enjoys traveling all over the US, playing “pick-up” soccer, golfing, hunting and fishing. To send a message to Luis, please visit our CONTACT page. Soccer Sam was born and raised in Rochester, NY and fell in love with the great game of soccer in 1970 at the age of 10. Sam began playing that year with the Rochester Juniors and his uncle Al Oliveri took him to his first Lancers game. Sam has been an avid fan of Indoor and Outdoor American Soccer ever since and continues to play. IFSL 1985-2000: Soccer Sam took over as commissioner of the Irondequoit Fall Soccer League (IFSL) in 1985. This 20 team league offered Fall soccer to some of the best former Pro players, college coaches and this areas best local players. In 1994, an all-star team traveled to Agropoli, Italy and won an adult tournament. Sam and his board organized several international trips. Soccer Sam TV Show 1994-2006: In 1994, Sam started America's first weekly soccer TV show called "The Soccer Sam Show" on Irondequoit cable access. This weekly show featured the IFSL all stars, trips to Italy and the first Rochester Lancers reunion game and award banquet. The show covered local youth and adult soccer, including section V soccer and local teams competing in the US Open Cup. The show went weekly on the WB network. Sam interviewed some of the greatest names in the history of soccer on this show including Pelé and Mia Hamm. 1995: The Rochester Rhinos were introduced and the focus of the show became making the Rhinos a success. The Rhinos became the most successful team in the history of American Soccer and many attribute the success of the team to the show. The show will return soon! Kick This! The Soccer Sam Radio Show 1995-Present: This weekly radio show started in 1995 and several local soccer celebrities helped host the show. The show's focus is local soccer and covers only American Soccer! Jeff DiVeronica of the Democrat & Chronicle has hosted this show with Sam for years, James Weise is the News Director, Rich Jones is the Producer and Mike Moran is the Webmaster. Sam will soon introduce a national weekly radio show called "MISL Live." The Rochester Rhinos 1996-2009: Sam was the assistant to the GM since day one of the Rochester Rhinos. Sam took care of selling tickets, sponsorship, trades and most of the game day ideas for the early days of the Rhinos. Sam was part of the Rhinos radio team for years and introduced the Post Game Call-In Show. In 2008, under new owner Rob Clark, Sam became the Team President and helped rebuild attendance, sponsorship sales and new concessions. 1996: Section V Committee "Media Award"
2000: Town of Irondequoit "15 Years of Leadership"
2002: Press Radio Club "Charlie Wagner Award"
2005: County of Monroe "Outstanding Asset Builder"
2005: Section V Committee "Media Award"
2008: Eastridge High School "Hall of Fame"
2010: Frontier Field "Walk of Fame"
2011: Camp Good Days "Ring of Honor"
Salvatore's: Salvatore "Soccer Sam" Fantauzzo is the Founder and CEO of Salvatore's Old Fashioned Pizzeria. In 1978, Sam took a High School project and opened the first Salvatore's location. Today there is 22 locations throughout Monroe County. The Salvatore's Pizza Family employs over 700 Rochesterians. Sam is married to Linda Fantauzzo and resides in Webster with his children Salvatore II, Roxanna, Silvio and two grandchildren Santino and Salvatore III. To send a message to Soccer Sam, please visit our CONTACT page.